When I added "Go to a drive-in movie" to my list, I am not sure what I expected. Probably something close to this. The reality of the drive-in experience in Minnesota more closely resembles a tailgating party. Though I've never done that either so what do I know? Vali-Hi Drive-In Theater in Lake Elmo is a 30 minute drive east from our home. We arrived at 7:00 p.m. and there were two long lines of vehicles waiting for admission. We paid the $8.50 per person which is a great deal if you intend to watch all three movies. The films showing on our visit were Maze Runner: Scorch Trials, The Visit, and Spy. Once in the lot, I realized we were unprepared for the experience. Our little Prius was surrounded by lots of pick-up trucks, SUVs, minivans, and station wagons backed into their spots. There were grills, coolers, camping chairs, tables, sleeping bags, and people in their jammies sitting on the car rooftop or laying in the bed of their trucks. While waiting for the show, we walked around with Stewie and he met a few other furry theater goers. Having him along was a highlight for me since we so rarely bring him to places. I bought some popcorn from the concession stand and soon realized it would have been smarter to bring our own snacks and drinks like the pros. A few minutes past 8:00 p.m it was showtime. Scott and I haven't seen The Maze Runner and haven't read the trilogy so we weren't sure how much of this second in the series we'd understand. Turns out, that was the least of my concerns as I slept through about 50% of it. Scott was also not a fan. In fact, he wasn't a fan of the entire experience. Some of the strikes against drive-ins: the projection wasn't bright enough and too much ambient noise, sights, and smells (headlights, people talking, and smoking). 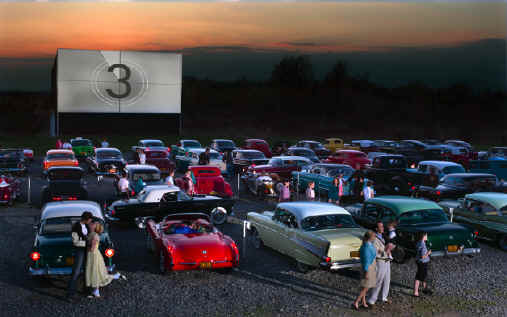 As opposed to the majority of my 40x40 list, it is unlikely we will be returning to a drive-In. All that said, I'm glad we have now experienced a night at a Minnesota drive-in. My favorite part of the night was watching this beautiful sunset evolve.